The excerpt from Spence and Sadie (aka The Boss's Wife For A Week) has made it onto my website. No pic of the cover because my webmistress has been under the weather, but you've seen it here. It will get up there when the revamp of my website goes up around the 1st of September. I'm looking forward to that. It's been a long time coming -- and it won't be complete then, but the basics will be up and the framework. I sent the corrections to Flynn and Sara's galleys back today, so that's out of my hair. And I got the excerpt up, and a new home page letter written, and the library books returned, and the course work for my US migration patterns course finished. And I am past Wickham and Lydia's wedding in Mr Darcy's Diary. I love Mr Darcy's Diary. 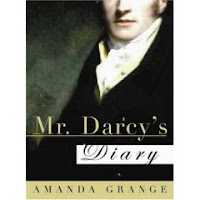 The way Amanda Grange gets inside his head and lets readers see how Darcy changes is extraordinarily impressive. And it is so totally in character. I love this book. I've read bits and pieces of it out loud to my husband, who teaches Major British Writers. He has added it to his bibliography of extra books his students may want to have a look at. I hope lots of them do. Thank you, Amanda, for a wonderful read. Tomorrow it's time to throw myself at Seb and Neely again. They've had a week off while I got everything else caught up. I still have my review to write, but the rest of it is done. So, Seb and Neely, be forewarned. I expect lots of words and actions from you. I see that Kate's blog party is drawing to a close. I believe this means that the piece I wrote a while ago will be making its appearance. If you haven't stopped by, you must, just to read Michelle Reid's wonderful ode to their friendship.